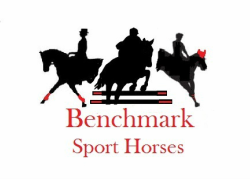 Benchmark Sport Horses is a training and sales barn located in Camden, Delaware. We specialize in acquiring thoroughbreds from racetracks all over the United States to be retrained and sold into new careers. Founded in 2007, it is the go-to place to find your next thoroughbred. Each thoroughbred is hand picked by Jessica based on conformation, athletic ability, temperament and soundness. We have a specialized program to address any issues found with feet, teeth, diet and body soreness. Each horse is allowed to rest and then is carefully restarted on the flat, over fences, on trails, out cross country and more. The farm is comprised of 8 stalls with doors that open directly into paddocks so the horses have the option to come and go as they please. Lovely grass pastures that are rotated weekly. Each paddock has slow feed hay boxes to keep the horses eating throughout the day. 100x200 sand ring with lights and a 40x80 sand lunging/free jump area. Trails directly off the farm. Wash stall and tack room.